that you are going to see something in three parts that you work with? I am taking for granted the word Tarot is a French derivative of Tarocchi. The use of the word Tarocchi and Taraux is proven for the year 1505 in two cases, one for Italy, one for France (recent findings of Depaulis and Francesschini). Before that date a use is unknown. The English and French word tarot derives from the Italian tarocchi, which has no known origin or etymology. One theory relates the name "tarot" to the Taro River in northern Italy, near Parma; the game seems to have originated in northern Italy, in Milan or Bologna. Other writers believe it comes from the Arabic word طرق turuq, which means 'ways'. Alternatively, it may be from the Arabic ترك taraka, 'to leave, abandon, omit, leave behind'.According to a French etymology, the Italian tarocco derived from Arabic طرح ṭarḥ,'rejection; subtraction, deduction, discount'. There is also the question of whether the word tarot is related to Harut and Marut, who were mentioned in a short account in the Qur'an. According to this account, a group of Israelites learned magic, for demonstration and to test them, from two angels called Harut and Marut, and it adds that this knowledge of magic would be passed on to others by the devil. What can be taken into account here is the phonetic resemblance of tarot تاروت to Harut هاروت and Marut ماروت. Let us now examine the word TAROT, or TARO, and discover, if we can, its true derivation and meaning. Court de Gèbelin states that there are three words of Oriental origin preserved in the nomenclature of the Pack. These are TARO, MAT, and PAGAD. Taro, he says, is pure Egyptian; from TAR, Path, and RO, ROS, or ROG, Royal--the Royal Path of Life. MAT is Oriental, and means overpowered, murdered, crack-brained; while PAGAD, he adds, is also Oriental, form PAG, chief, or master, and GAD, Fortune. Vailant says: "The great divinity Ashtaroth, As-taroth, is no other than the Indo-Tartar Tan-tara, the Tarot, the Zodiac." My derivation of the word, which I have never found given by any author, is from the ancient hieroglyphical Egyptian word "târu", to require an answer, or to consult; ergo, that which is consulted, or from which an answer is required. This appears to me to be the correct origin of the word, while the second t is an Egyptian hieroglyphic final, which is added to denote the feminine gender. The following are interesting metatheses of the letters of TARO: TORA (Hebrew) = Law; TROA (Hebrew) = Gate; ROTA (Latin) = wheel; ORAT (Latin) = it speaks, argues, or entreats; TAOR (Egyptian) = Täur, the Goddess of Darkness; ATOR (Egyptian) = Athor, the Egyptian Venus. A Mr. Lumley tells me that there is a Zend word "tarisk", meaning "to require an answer". The term Trionfi was used in italy in the fifteenth century to describe the twenty-two Major Arcana cards. The term Tarocchi subsequently came into usage in Italy in the early sixteenth century, first referring to the twenty-two Majpor Arcana cards, and thereafter to the complete seventy-eight card deck…..The words tarocchi and tarocco are often used interchangeably, although tarocchi is actually the plural of tarocco. Tarot, the French derivitive of Tarocchi, has come into widespread usage in the English language. All my many books cite what Tarot means, not has there been a discussion that I can find about the Italian word Tarocchi maybe someone here can point me towards it. I have liked SteveM’s idea of ‘Trifle’ or ‘Trunk’- but I cannot find his discussion. Ross G. R. Caldwell wrote: The Italian writer Berni, in 1524, offered that tarocco meant "foolish, stupid, simple". It was believed that he was only making up a meaning based on the sound of other Italian words - sciocco etc. But I found it used in the late 15th century by the poet Bassano Mantovano (writing in Milan) as "tarocus" (sometimes given as "tarochus") meaning the same thing - a fool, an idiot. Since then Thierry Depaulis has also found some examples showing that a group of words in Proveçal and Catalan with the sound "taroc" mean the same thing. They seem to derive from a word meaning a stump or block of wood, thus used metaphorically for an idiot, a block-head; like we say in English, "dumb as a post". So the sense is "dumb as a stump". Why would this be given as the name of former Triumph cards? We can only guess at this point. I suggested once that it meant "crazy cards" - since they were larger and had many more cards than the regular pack. But another good suggestion is that it refers to the Fool in the game, which no other game has (the Joker was invented indepently in the US only in the 19th century). I mean the special card depicting a fool, with his special role, and not the depiction of Unters or other regular cards as fools, which of course some packs, especially German ones, of course have. There is a long convoluted reason for what I have suggested in this thread. Thank you marco for the thread and the other thread within it about the French eating monster Tarasque. Without going into a great 'convolution' I was reading (Very slowly ) in Church Latin/Ecclesiastical Latin some stuff about the Mass. I was surprised about a statement about how the eyes put things in line (like the Stations of the Cross)or the more easily understood the eyes place things in an order looked like Tarrochi. In oculi enim oro/arare and into early Italian Occhi per oro or somewhat similiar depending on the dialect- ie Umbrian/Tuscan etc. So I thought.... a Game name somehow with the church understanding of a visual sequence like the Mass. The Eyes....something A Game called "USE YOUR EYES" lol. Hey, for the origin of "tarocchi", don't forget this one. 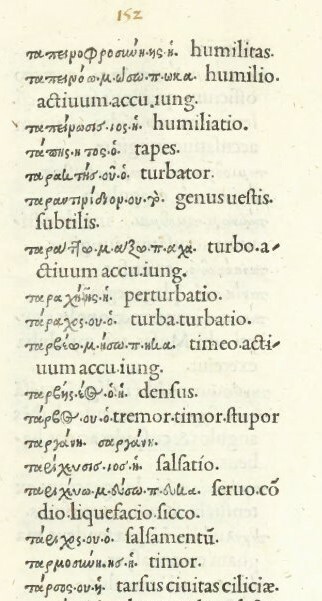 I reproduce part of a page from the Aldine Venice 1497 Greek-Latin Lexicon (Lexicon Graeco-Latinum), by Giovanni Castoni. It shows two "tarach-" (tau alpha rho alpha chi) words, defined as "pertubatio" and "turba, turbatio". The first of these Latin definitions, according to Wictionary, means "confusion, disturbance, disorder, commotion, revolution, perturbation, passion"; "turbatio" means "confusion, disturbance". These meanings are in line with the 16th century Italian meaning of "taroccare" (see Andrea Vitali's essays for numerous examples, e.g. http://www.associazioneletarot.it/page.aspx?id=269). Andrea theorizes that the word got applied to the card game because of how worked up card players got. And also "Matto" means "crazy", which is similar, and so is in line with it's being the "game of the Fool." I reproduce here all the "tar-" entries, in case I missed anything. I got the scan by email from the University of Texas Ransom Center Library, which has the original 1497 book. In English, the words "ataraxia", meaning "calmness", and "ataractic", calm, come from the same root (http://dictionary.reference.com/browse/ataraxia). According to the source just given, the root-word also existed in Latin as a borrowing from Greek. mikeh wrote: Hey, for the origin of "tarocchi", don't forget this one ... It shows two [Greek] "tarach-" (tau alpha rho alpha chi) words, defined as "pertubatio" and "turba, turbatio". ... In English, the words "ataraxia", meaning "calmness", and "ataractic", calm, come from the same root (http://dictionary.reference.com/browse/ataraxia). According to the source just given, the root-word also existed in Latin as a borrowing from Greek. Ataraxia is also the highest state a Stoic can achieve, after mastering all the virtues and triumphing over all of life's disturbances. Perhaps one of the triumphs is the player's over chance. Machiavelli is often described as someone who deliberately and self consciously adopted the Republican/Stoic ethos of 1st Century BC Rome; how much does this apply to run of the mill, card playing courtiers? The quote of the French naming the traitor card after Bernadino can be found in several 18th and 19th century Italian and German books, and the primary source of all of them seems to be the 16th century mapmaker and cartographer Tomaso Porcacchi da Castiglio Aretino, who also illustrated some allegories for the poem 'Orlando Furioso' by Ludovico Ariosto. From what I can make out the story of Bernadino appears in book 4 of "Giudicio di Tommaso Porcacchi, la vita del Guicciardini descritta da Remigio Fiorentino, dediche al conte Leonardo Valmarana e a Cosimo de' Medici." That is contained in the History of Italy divided into 20 books, by GUICCIARDINI FRANCESCO written between 1537 and 1540 and first published in 1561. (Note this information is from sources in languages other than English which I may have misunderstood and need verification by someone with greater knowledge of Italian and German). Bernardino di Corte to the French, who occupied it from 1500 to 1512.
to his credit with the hospital of S. Maria Nuova." Pursuing this french version of a tarocchi appropriati like game I ask myself, if the french associated Costi with the tarocchi traitor, with which card would they associate il moro? I would say it is feasable that il moro would be il matto, and we are very close then to il moro (the mulberry tree, Ludovic Sforza) as this tarocch (tree) who was a blockhead (tarocch) for entrusting Milan to Costi, the traitor (of the tarocch). In the frontpiece of the Italian translation of The Life of Francesco Sforza, 1490, in which il moro is portrayed as a mulberry tree, he is also shown with a gold disc with the letter M in it - which some french or papal wit of the time in making such tarocchi appropriati may read as M for Matto (it is indeed a bit like the M on the back of the 19th century soprafino matto). Even his mother seems to agree he was a blockhead. So you are talking about something other than the hand painted cards? Already in 1550 "Tarot" was considered a word with unknown etymology. "E quel nome fantastico e bizzarro di Tarocco, senz'etimologia,..."
And this uncertainty was the situation few years after the invention of the Tarot!!! Hi E.R. I totally agree with you....we are expected to agree with some facts, but not with others. A hundred years or a little more- someone forms the reason for the the trumping order and what card trumps the next, and they also say the name is nonsensical. Now in one hundred or so years a popular game that has a name that is unknown is pretty unusual. Most games seem to have 'an understandibilty' and a locatable name History. Ludo apparently comes from the latin name for dice for example. They say "Minchiate" comes from a dialect word meaning nonsense and a very similiar word in Italian is 'minchionare' which means to make fun of something. It seems likely that there might be some correlation of a pun....that is why I opened the thread with "What if...." so speak with the eyes seems just as possible as anything else. The curious mix of Latin and local languages formed Italian and all other romance languages so a play on this mix seems as likely as other words like cauliflower- Cavofiore- Hollow flower or cave flower. We might never know for sure.........but I have never seen a 'Fools' game.Who wants to win at a Fools game? Why not stick with Trionfi or Triumphs if that is what Tarot was in the beginning?